San Marcos, California – a city with more than 91,000 residents, almost half of which are employees. Did you have a job in San Marcos? How long did you work in your previous workplace? When you started working there, did you ever expect to be terminated? What was the reasoning behind your termination? Do you believe that you were wrongfully terminated? If you suspect that your employer illegally fired you from your job, do not hesitate to seek legal assistance as soon as possible. If you would like to explore the possibility of taking action against your employer after being wrongfully terminated from your San Marcos workplace, do not hesitate to contact our law firm as soon as possible. California Labor Law Employment Attorneys Group is an employment law firm that has dedicated many years to representing employees who have been victimized in the workplace. Our lawyers are ready to evaluate your claim and provide you with all the information that you need to take action against your San Marcos employer. To begin discussing your current situation with the knowledgeable wrongful termination lawyers in San Marco, do not hesitate to contact California Labor Law Employment Attorneys Group today. We are ready to fight for your rights as an employee. Wrongful termination occurs when an employee is terminated in violation of an employment law. Without a doubt, wrongful termination is illegal, but why are some terminations unlawful while others are not? Although there are many valid reasons to terminate employees, many employers terminate their employees for illegal reasons. Because of that, there are many laws on both the federal and state levels that are designed to protect employees from unjust treatment (including unlawful termination) in the workplace. These laws protect employees in many ways. It is illegal for employers to terminate their employees in violation of any of the laws mentioned above. If you believe that your employer wrongfully terminated you and violated any of the laws mentioned above, do not hesitate to seek legal assistance as soon as possible with the wrongful termination attorneys at California Labor Law Employment Attorneys Group. What are the EEOC and DFEH? If you were the victim of wrongful termination, you might have grounds to take action against your employer. All employment claims must go through the appropriate employment agency. On the federal level, employment claims, such as wrongful termination claims, must go through the Equal Employment Opportunity Commission (EEOC). The EEOC enforces all employment laws and handles all employment claims on the federal level. On the state level, wrongful termination claims and other employment claims must go through the Department of Fair Employment and Housing (DFEH). The DFEH – like the EEOC – enforces all state employment laws and handles all employment claims when they arise. These agencies investigate employment claims that are brought forth and take action against employers, when found necessary. Unfortunately, many employees are unaware that these employment agencies exist; therefore, many employees that are wrongfully terminated never take any action against their employers. If you would like to learn more about the EEOC and the DFEH – and your right to file a wrongful termination charge with any of these agencies – do not hesitate to seek legal assistance as soon as possible. Our attorneys are ready to provide you with all the information that you need to take action against your employer. You were wrongfully terminated. Without a doubt, you have the right to take action against your employer and file a wrongful termination charge through the EEOC and DFEH; however, do you have the right to sue your employer? Do you have the right to file a civil lawsuit against your employer after he or she wrongfully terminated you? All employment claims must go through the EEOC and DFEH, for example. You could only pursue a civil lawsuit against your employer after you have been granted the right to sue from the EEOC or the DFEH. After the EEOC or DFEH provide you with a right-to-sue letter/notice, you will have the right to pursue a civil claim against your employer. These agencies automatically issue the right to sue after culminating their investigations; however, claimants could also request the right to sue. After being granted the right to sue, you will have a short length of time to take action against your employer – either 300 days (with the right to sue from the EEOC) or 1 year (with the right to sue from the DFEH). If you would like to learn more about your right to file a wrongful termination lawsuit against your employer after being unlawfully fired, do not hesitate to seek legal assistance as soon as possible. Can I Recover Compensation after I Was Wrongfully Terminated? 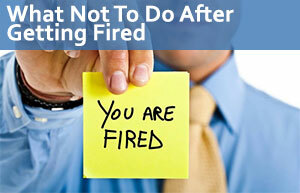 What could you expect after you were wrongfully terminated? If you take action against your employer, should you expect to recover any sort of compensation? In general, employees hope to be reinstated; however, this is usually not possible due to tension and hostility in the workplace. Many employees who have been wrongfully terminated are surprised to learn that they could recover compensation. Lost wages: includes compensation for all the income lost due to the wrongful termination (both back pay and front pay). Lost benefits: includes compensation for all the work benefits (such as health insurance, life insurance, and stocks, for example) lost after being wrongfully terminated. Pain and suffering: includes compensation for all the mental/emotional suffering that resulted because of the wrongful termination (examples of mental/emotional suffering include depression, anxiety, fear, embarrassment, etc.). Punitive damages: includes compensation awarded to punish the defendant/the employer for illegally firing their employee. Have you found yourself constantly wondering about the compensation that you might be eligible to recover if your wrongful termination claim is successful? It is perfectly normal to be curious about the specific type and amount of compensation that you might be eligible to recover after being wrongfully terminated from your San Marcos workplace. If you would like to learn more about your right to receive compensation after being wrongfully terminated, do not hesitate to contact our San Marcos wrongful termination experts as soon as possible. The lawyers at California Labor Law Employment Attorneys Group are ready to aggressively fight for your right to recover the maximum amount of compensation available for your claim. To learn more about the type and amount of compensation that you might receive if your claim is successful, contact our firm today. Are you the victim of wrongful termination? Do you believe that your employer terminated you unlawfully? If you believe that you were wrongfully terminated by your San Marcos employer, you might have grounds to take action against your employer. Could you take action against your employer? Could you be compensated in any way? You have rights as an employee, and you might have the right to take action against your employer if you were wrongfully terminated. If you would like to learn more about the possibility of pursuing a wrongful termination claim against your employer in San Marcos, do not hesitate to contact the experts at California Labor Law Employment Attorneys Group. The experts at our law firm have many years of experience handling a variety of employment claims, including wrongful termination claims. When you contact our law firm and allow our experts to handle your claim, you could be certain that our wrongful termination lawyers will always do everything within their reach to ensure that you have the tools that you need to take action against your employer. Our law firm is dedicated to ensuring that all victims of wrongful termination have access to our legal services. Unfortunately, wrongful terminations are quick to cause financial distress. Therefore, many victims of wrongful termination simply do not seek legal assistance because they believe that they cannot afford it. At California Labor Law Employment Attorneys Group, we offer free legal services to ensure that all employees who have been subject to wrongful termination have access to the legal assistance that they need. Our firm offers both free consultations and free second opinions. During our free consultations and free second opinions, our lawyers will be available to provide you all the information that you need to begin or continue your claim against your employer – ensuring to answer all your questions and address all your concerns. Would you like to discuss your claim with a wrongful termination lawyer in San Marcos? If so, do not hesitate to seek legal assistance with the wrongful termination lawyers at California Labor Law Employment Attorneys Group today. As mentioned above, our firm is dedicated to ensuring that all employees affected by wrongful termination have access to the legal assistance that they need. Therefore, our firm offers a Zero-Fee guarantee. Our Zero-Fee guarantee ensures that our clients never have to worry about having to pay any upfront legal fees for any of our legal services. Our law firm is also based on a strict contingency status that ensures that you will never be required to pay any fees until after your claim is successful. If you do not win, you will not be required to pay. If you would like to discuss your claim with the San Marcos employment attorneys at California Labor Law Employment Attorneys Group, do not hesitate to contact our law firm today.